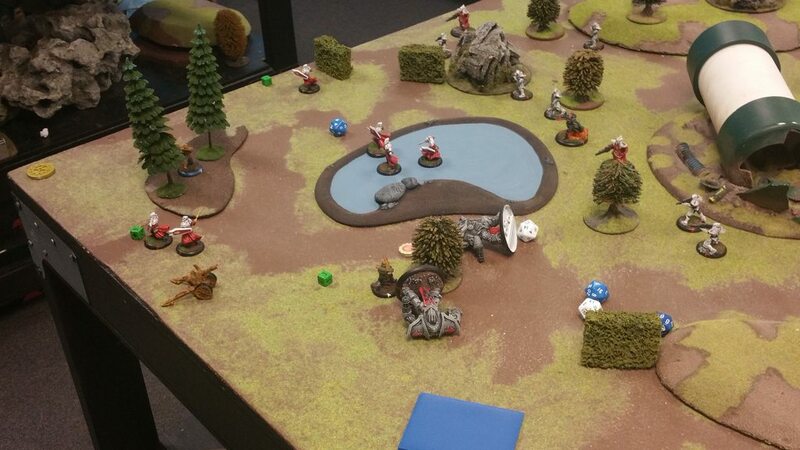 Had another great Southlands Campaign match today against the Brotherhood! I'll see about getting permission from Duck_Bird to post the pictures they got, and put them in with mine. 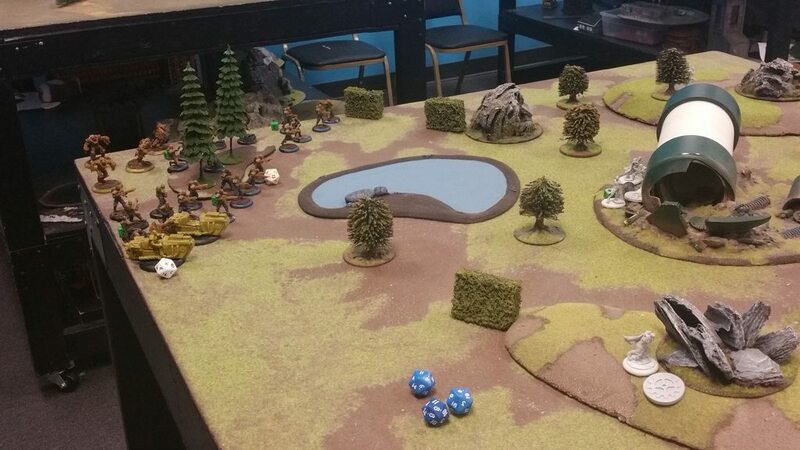 I decided I'd try something new and just do a sort of 1 sided battle report! We'll see how it goes. Be warned though, it sputters out around turn 4, as I stopped taking notes. We played a beta level mission. 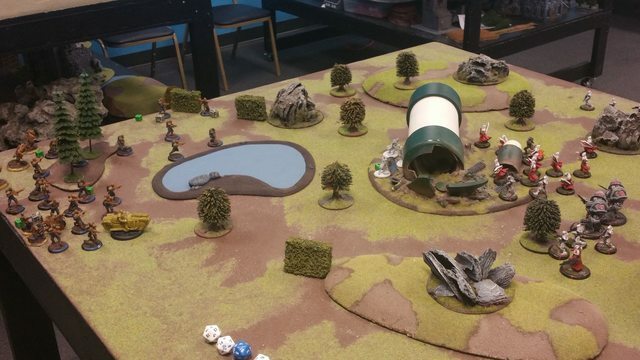 We used a mission from the Diesel Powered pdf called Head of the Snake. 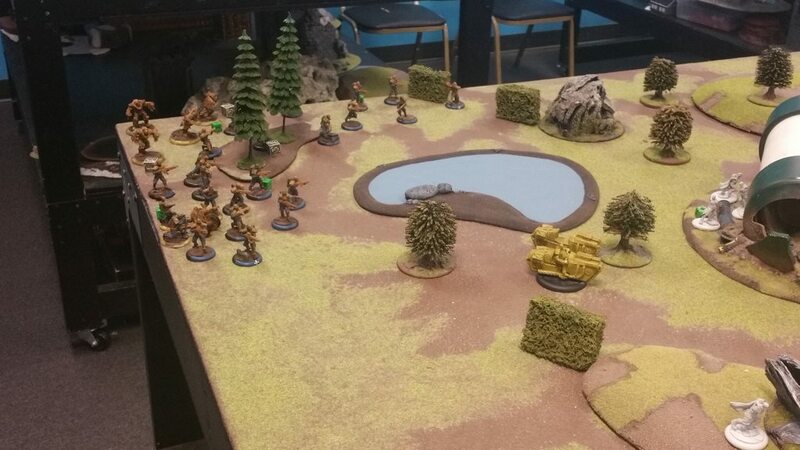 The objective is to kill all squad commanders for 10pts or kill as many as you can and more than your enemy for 5 points and a partial victory. I rolled Ammo Dump as my secondary mission. My opponent rolled a 1 and picked Inspiring Leadership. 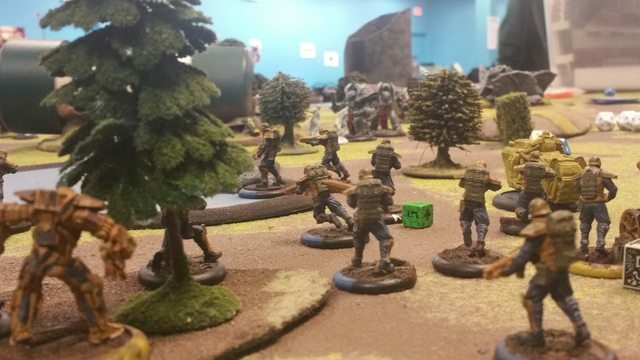 Wolfbane commandos infiltrated and dispersed in order to sit on all the secondary objective markers and sieze them turn 1 for a quick 5 points. Vorreiters providing a -3 to anything shooting at the BAK unit. BAK unit sheilded from early game RDs by the Vorreiters and 2 squads of Hussars. Juggernauts and the Warlord in the rear of the formation to be able to move quickly to sure up breaches in the lines. The coming hoard of Zealots! Early on I knew that this would be tough battle. Sacred Warriors are very scary with their high heal rolls and even higher inpen armour. I early on would grab my secondary objective to give myself a 5 point lead. I knew that I had a very low chance of getting an Major Victory, early seizure of the secondary objective would at beast get me 5 points to hopefully tie, or if it came to partial completion of the objective 10 pts. Hit units far out with the BAK and Hussars, focus on the infantry and try to force the opponent to commit to coming from one side or another of the divergence. 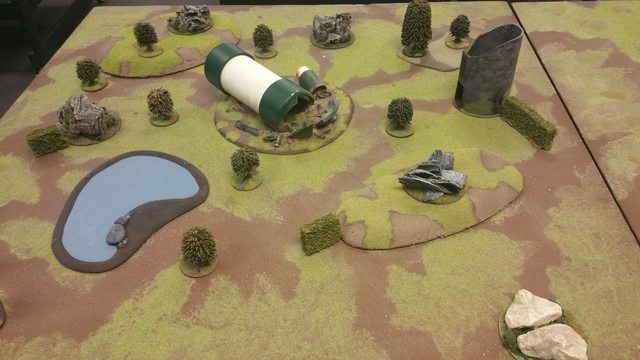 The terrain to the left side of my deployment had some nice choke points so I tried to force models to my left. This would also keep the enemy far away but in range of the BAK. But as soon as the turn began the Brotherhood prayed the Earthquake away! Prayer of Repentance! This brings an early end to my hopes of funneling the enemy. 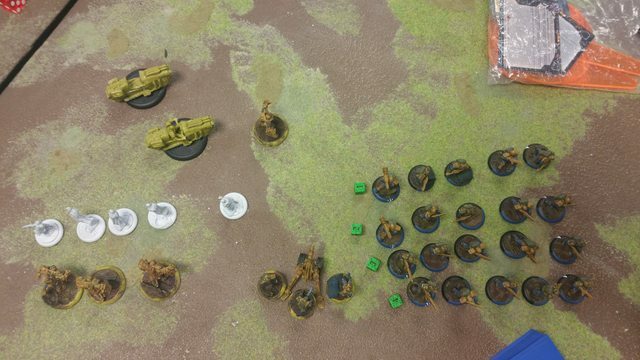 My first activation is the Commandos who succeed in locating the ammo dump and placing the charge. 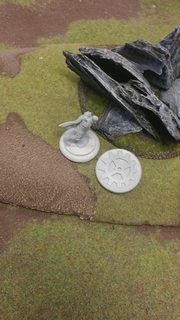 The Commando that finds it plants the charge and then forgets that it's going to blow up at the end of the turn and just stands next to it. The rest of the turn is mostly uneventful. The bulk of my army prepares for RD Valks that never come. The 2 Vorreiters bike forward to get some early shots on the Judicators. They score a few hits, but cause no damage of note. Brotherhood has the initiative and plays Mirage. This limits all weapon ranges to 18 inches. This is not according to plan. This reduces the effective range of the BAK. 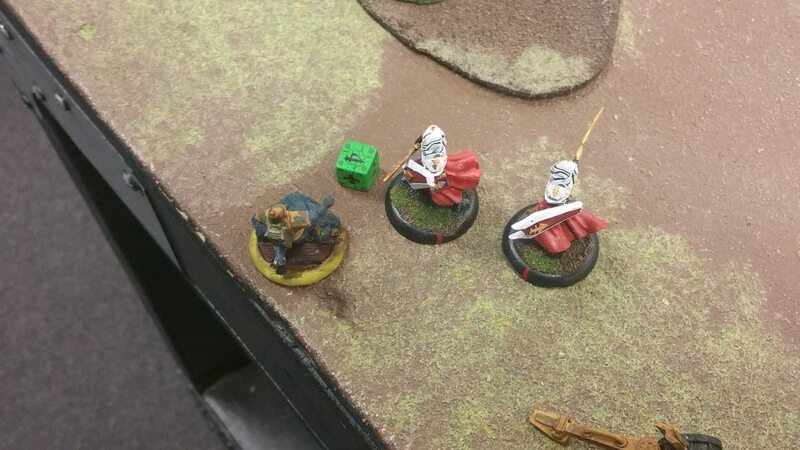 First activation the an Inquisitor fires a ruby lance at a Vorreiter and it one shots it engines and it explodes! The Vorreiter falls back and regroups at the BAK. 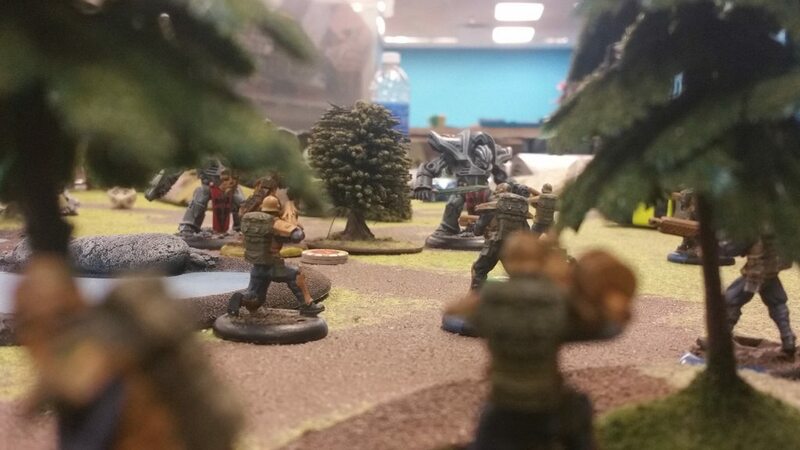 Judicators lumber forward and are charged by 2 Wolfbane Commandos! Wrath of the Clansmen! The Wrath of the Clansmen is not as advertised and they are unable to do any damage to the Judicator, but the do succeed in slowing them down for a few turns. 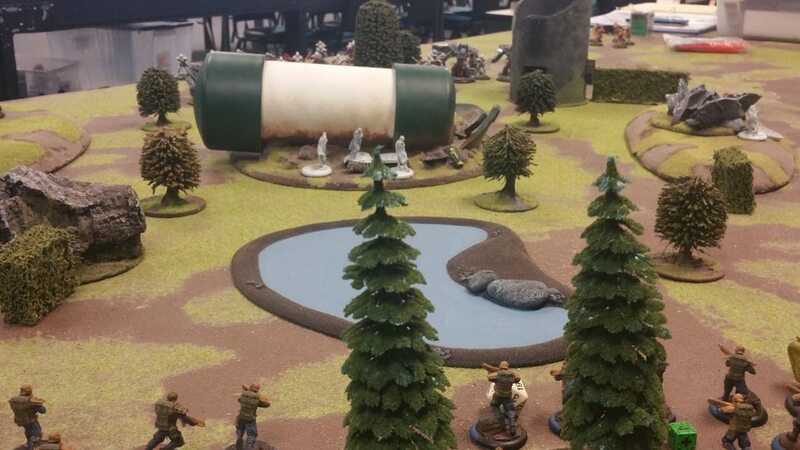 the end of turn 2. 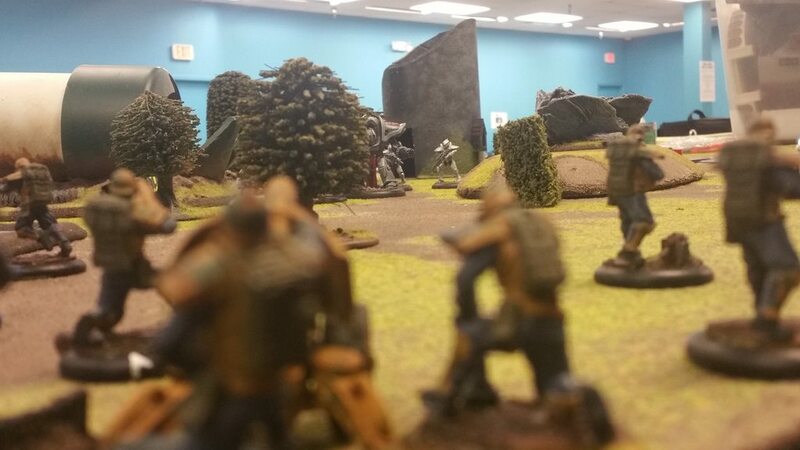 The Wolfbane Commandos don't survive the combat. I played Seismic Disruption again the Brotherhood tries to pray the earthquake away again but due to a Collapsing Chain of Command they can't focus. The the disruption will cause no casualties but it does server to delay them. 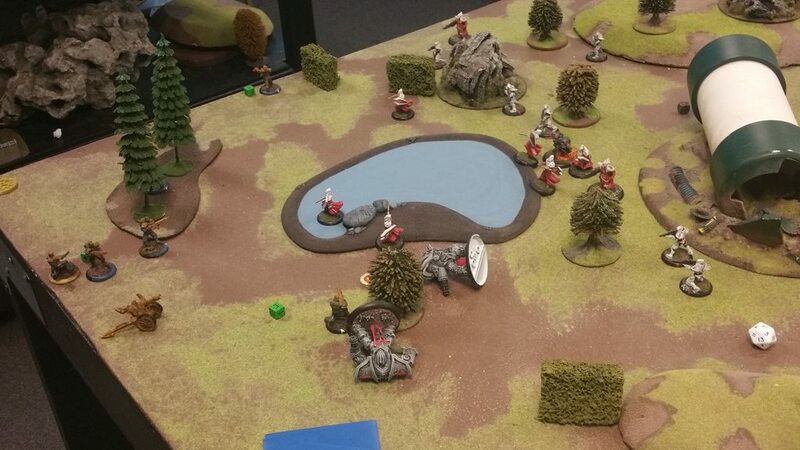 Valkyries land just outside the lines on the left flank! Their attack stalls! The Moment has Come! 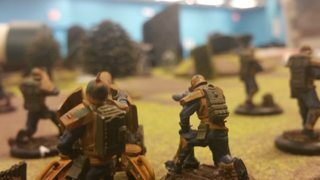 Juggernauts charge forward! They close with and and destroy the Valkyries! The BAK prepare the MLRS for action! "Crew! Direct front! Walker in the open! Half range! Focus Fire! On my command!" Master Gunner Bidermann remains calm and gets his gun ready for action! 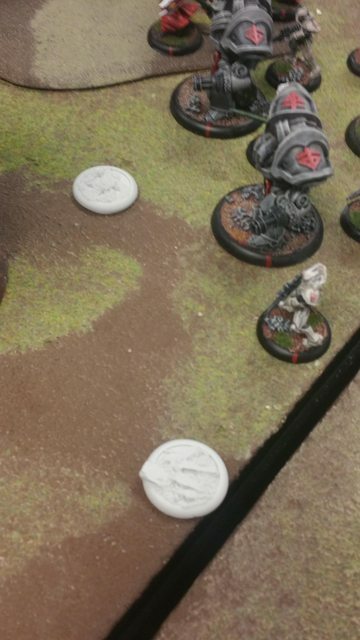 Bidermanns gun crew scores several hits to a Judicator! The Walkers charge forward! My Juggernaut Warlord responds in kind! 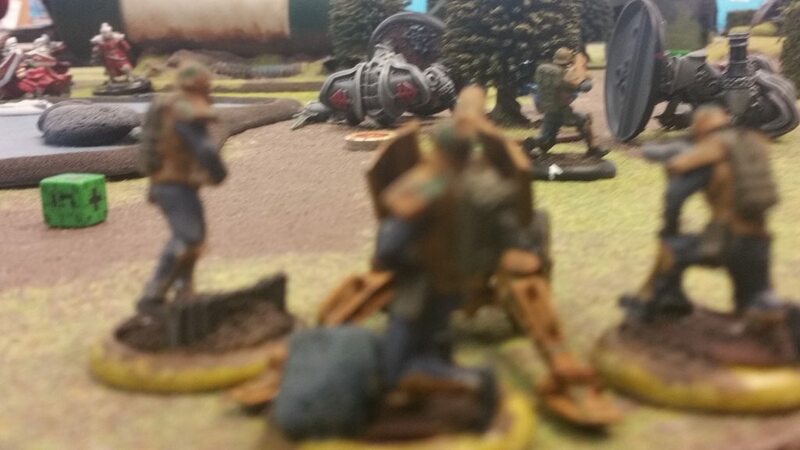 A Hussar armed with an ARG does a Judicator in before it can close with the BAK! At this point my notes become less detailed and I become to engrossed in the game to take good notes but I manage to get some good pictures. Mostly focusing on the BAK crewmen. The BAK change targets and attempt to relieve pressure on the left flank! 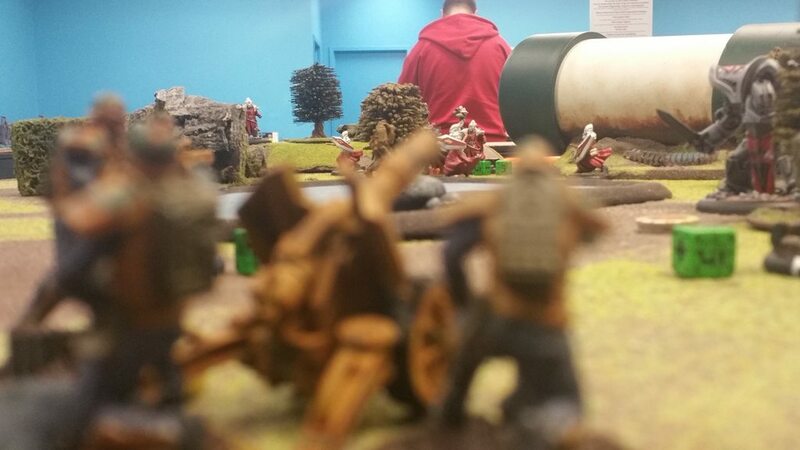 The next turn the BAK fires at a walker just outside of it's minimum range! They take it down! This is at the end of game. Bauhaus fights to the last man. Master Gunner Bidermann is the last remaining squad commander. He is mind controlled by the enemy warlord to drag him into the open! Hussars rush to cover him. But alas the brave Hussars cannot stop the sacred warriors and their dirty magic from closing with Bidermann and striking him down! 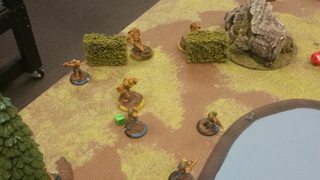 MG Bidermann points and laughs as the Sacred Warriors strike him down. Though he dies he knows that elsewhere in Sector D, Bauhaus will triumph! Bauhaus MVP: MG Bidermann and his crew. The effectiveness of the BAK is great. At 105 points these guys were great and easily killed points equal to the cost. No matter how many shots, these guys can just soak up the damage. My opponent did a great job at securing their flanks. It was very difficult to get any unit a view on their back sides to get around the inpen armor. Lots of shots from Hussars that just did nothing. A few ARG shots that just bounced off shells. And the fact that they can levitate.. close the door. High threat, hard targets. Hussars, armored or otherwise once again did a great job as the core of my army. 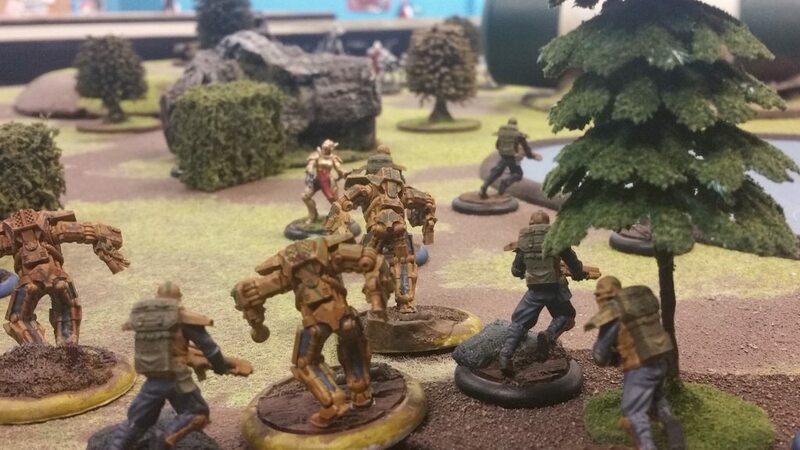 My inability to deal with the Warriors was their downfall, as they focused on the them the Troopers were able to outflank them and get shots in. I'm still at lose as to what to do with my Warlord. How to properly employ them is my biggest problem. The lose of half your resources when they die is a big deterrent in employing them too offensively, they are too important. Vorreitters were mediocre, this is only my second game employing them, so I can't can't say the unit is bad because I just used them incorrectly. Wolfbanes were an interesting choice. My first time deploying an non Bauhaus unit and I was very confused as to what to do with them after they seized the objectives. The infiltrate with dispersal is great tool for early game objective seizures. I'll have to try them with the ranged kits and see how that works. I still have a lot of experimentation to do with them. 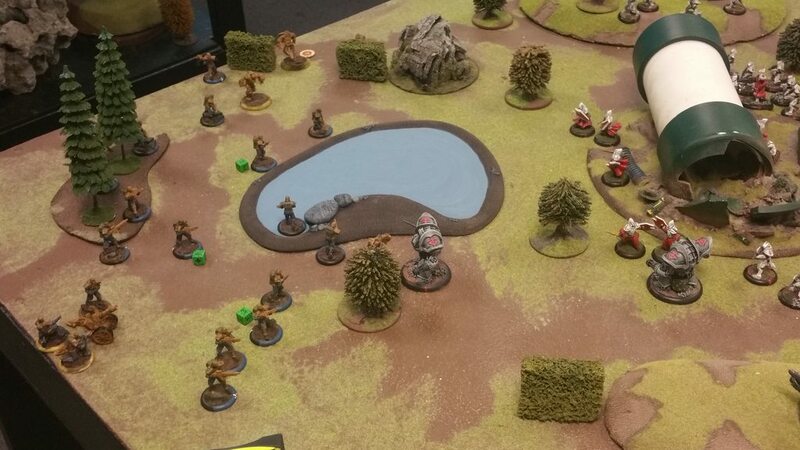 nifty battle report, and only showing the Bauhaus PoV didn't detract from it either. 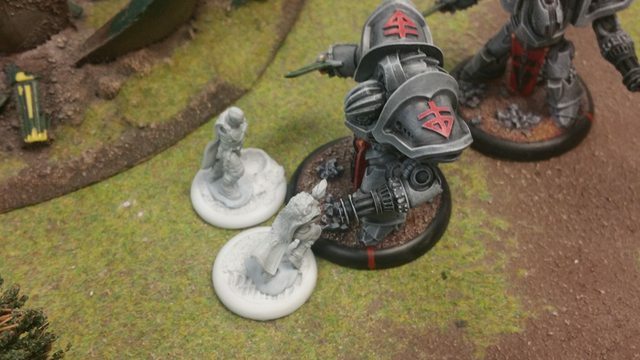 have you considered using the Vorreithers to try get around the flanks of the Brotherhood to try get some shots into the rear of the warriors? Between "Pedal to the Metal" (+4MV, taking them to MV 11!) and Full Throttle they get a massive 39" of movement, and still have an action to shoot with.